Verse 0 and 1, Now Available for Quick Reading! Verse 1 is now available for quick read on the site. Simply click here to be taken to the new verse if you haven’t yet read the story anywhere else! Remember that Verse 0 will expire after Verse 2 is released next week! I hope you enjoy my story! A new entry has been made! You can now learn more about one of the major settings in Yscariot™, West Nazares High School! Just click on the logo or check out the Glossary of Yscariot! There will be more updates as time passes. You may also check out other random pieces of information to get familiar with Yscariot‘s world! Epsilon is near completion which will contain a new batch of chapters to continue from where Delta left off. I hope that you will be ready to check out these newer chapters of my story. It will also be fun and free! Get ready! Will be working on Epsilon “ɛ”, and it is likely set to be the last book of the season, and possibly one of the last books to be released for free. Certain characters will be revealed in the coming weeks and some others will be further explained. A few more glossary entries and information updates will be made. Awaiting review for the next Spanish release. Currently in talks of releasing a book in another European language. Also, I have recorded an introduction to my podcast, which was released on the same day as the Spanish BETA Verses. You can listen in if you have about 45 minutes to kill. Thank you for 2500+ downloads! The Delta now has over 2500 downloads and that is amazing! I do want to also show everyone a physical print of my first major preview to my novel writing project, Yscariot: Neo-Alpha. Once again, thank you! Your support motivates me a lot! Download the Delta Verses (9~11) for FREE! If I score 50 downloads, I will return to California. Since it is important that I go through California to return to South Korea, I thought that I could spend a few days between other cities to vist any and all friends living in the state to include: San Diego, Los Angeles, and San Francisco for example. Scoring 100 will land me into New York, where it will be my first time ever stepping foot in-state, as well as a monumental moment in time for me, as I enlisted in the Marine Corps due to the attacks on the World Trade. I feel that I owe it to myself to be at the place of such event, and besides, it’s NEW YORK! Scoring 1000 downloads, a seemingly tough feat compared to the other requirements, will finally get me home. I have been living in South Korea for over a year now, and so many friends and family want me to come home. I thought, maybe they will participate and go crazy over this challenge for two reasons. Firstly, no one from where I am from is doing anything in life like writing a book, and I was sure that they would have shared such a thing with their friends and family. Secondly, it’s me writing this book. A project of this magnitude deserves some kind of attention, and I was hoping that with the big handful of friends and family that I have, that they would convince at least 2 or 3 people each to download my digital book, even if they were never planning on reading it because… well… it’s ME that wrote it! Such an accomplishment like getting 1000 downloads should be easy with a guy with a HUGE family. Did it happen? Well, that’s where the news comes in! Okay… okay… now for the GOOD NEWS! I’m afraid I’ve got some BAD NEWS! Miho, the character introduced in the Yscariot: Neo-Alpha preview now has a bio page with background information about her. Click on her picture to find out more about her. Two brothers, Riu and Sho, are introduced in the newest preview of Yscariot™. Click on the picture to get the new free preview, and visit the character bios to learn a little more about both new characters! Verses 9~11 are now available on Google Play! Click the image below to download it now! 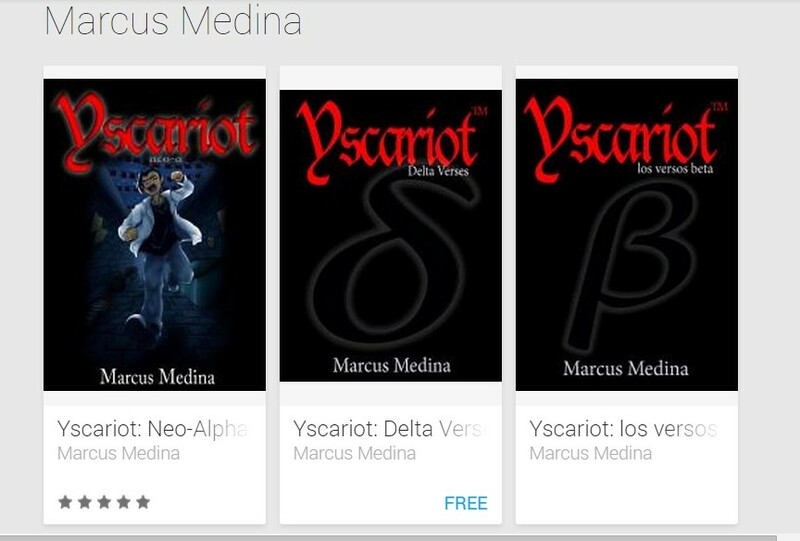 You can now Pre-order my works for FREE on Google Play by searching “Yscariot” or visiting the link below.